The middle of the colours—their ‘centres of gravity’—are shown by p, q, r, s, t, u, and x. The centre of the circle, at O, was presumed to be white. 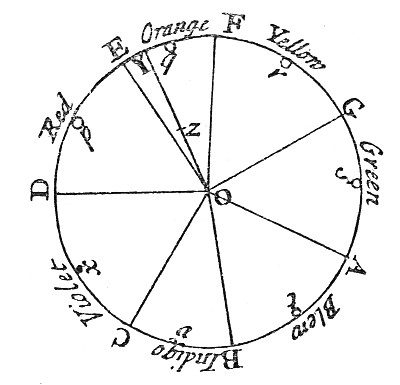 Newton went on to describe how a non-spectral colour, such as z, could be described by its distance from O and the corresponding spectral colour, Y.